Did the Hindus Help Write the Bible and Give the Ancient Mexicans Their Religious Traditions? A new study conducted by the Supreme Council for Antiquities in Egypt has determined that the Great Pyramid of Khufu at Giza consists of one million limestone rocks. The number is under half of the previously estimated amount of 2.3 million stones, indicating that the Egyptian pyramid builders were even more organized and efficient than previously thought. A 13,000-year-old skull found in Mexico may help prove theories that some of the New World's first settlers arrived along a Pacific Coast route from Japan, and not just across the Bering Strait. Was Maya Pyramid Designed to sound like the sacred Quetzal Bird? Clap your hands in front of the 1,100-year-old Temple of Kukulcan, in the ancient Mayan city of Chichen Itza, and, to some researchers' ears, the pyramid answers in the voice of the sacred quetzal bird. For those who missed The Learning's Channel's "Mystery of the Skulls" this past summer. It will be replaying this Friday evening, the 6th. Check your local listings for times, understanding that shows on TLC usually play twice per evening, three hours apart, in every time zone. What Happened 12,000 Years Ago That Killed So Many Animals? At least 35 genera of animals in North America alone were wiped out, including the huge saber-toothed cat, woolly rhinos, woolly mammoths, mastodons, giant skunks, giant rabbits, camels and horses. What killed off so many large mammals of North and South America at the end of the last ice age about 12,000 years ago, the end of the Pleistocene? The new source of energy? The Mayan Mystery: a Lesson From the Past. Why did the Mayans abandon their cities so suddenly? Historians of the world have not discovered the reasons for the ancient Mayan�s strange behavior, a people who lived in densely populated cities with a developed culture and then suddenly vanished. The first Mayan settlements appeared around 2000 B.C., but by 950 of the Common Era, the majority of the lowland cities were abandoned. NOW, FOR THE FIRST TIME: Enter the Bent Pyramid! The interior of the Bent pyramid is largely unpublished and there are no color pictures easily available to visit it. Now, for the first time, you can explore much of the interior. At today's rates of compression, you could download the entire 3 billion digits of your DNA onto about four CDs. That 3-gigabyte genome sequence represents the prime coding information of a human body � your life as numbers. Biology, that pulsating mass of plant and animal flesh, is conceived by science today as an information process. Is there a planet X that will cause global catastrophe next May? An article by Phil Plait, an astronomer at Sonoma State University and the Web master of Bad Astronomy ( www.badastronomy.com ). A 17,000-year-old culture that lived in what is now the western desert of Egypt knew precise data about our galaxy. Analizing a recent archaeological find at the site of Nabta Playa (radio carbon dated to as early as 10,000 BC), astrophysicist Thomas G. Brophy demonstrates that finely carved stones and engraved bedrock contained specific coordinates of stars as early as 16,500 BC. They also contained accurate information on the configuration of our Milky Way with the exact position of our Sun and the galactic center as of 17,430 BC. A valuable scientific detective story that confirms very ancient prehistoric human knowledge. The following pages are intended to be a round-up of the news and recent developments in various studies of the mysterious pyramid structure that was discovered in 1985 by dive tour operator, Kihachiro Aratake, off the coast of Yonaguni-jima, Japan. NASA hires writer to challenge Apollo conspiracy theorists. Sometime within the next two years, researchers will detect the first signals of gravity waves -- those weak blips from the far edges of the universe passing through our bodies every second. Predicted by Einstein's theory of general relativity, gravity waves are expected to reveal, ultimately, previously unattainable mysteries of the universe. Tony Wilkinson, Research Associate and Associate Professor in the Oriental Institute and Near Eastern Languages & Civilizations, along with colleagues spanning the sciences and humanities, wants to apply computer simulation technology to ancient Mesopotamia. Curious about the way the universe looked in the past or how it will look in the future? The Starry Night Pro software allows you to travel through 200,000 years of time in a matter of minutes. I've written a new update outlining events since the latest funding campaign kicked off in early July. This new update is the post-September analysis that was promised at that time. The investigator was surprised to discover no signs of processing on the skull�s perfectly polished surface. They couldn�t be seen even with a microscope. Related link: Crystal Skulls. Robert Bauval's website has posted a review on the "Secret Chambers Revealed" feature. In Cuban Depths, Atlantis or Anomaly? Images of Massive Stones 2,000 Feet Below Surface Fuel Scientific Speculation. Satellite Evidence for a Lost Civilization? A triangular feature that appears to have been artificially created is revealed by satellite imagery off of the Berry Islands, near Nassau. A stone tablet with an elaborate scene and numerous hieroglyphs carved in low relief was found on the side of a low platform in Temple XXI. Related article: Protest leads to discovery anouncement. Peruvian archaeologists discovered more than a thousand new geoglyphs (and 'gold objects') near Nazca - predating the nearby famous 'Nazca Lines'. The NASA Space Shuttle Earth Observations Photography database of over 400,000 images is a national treasure. This site contains selected photos and related captions to provide a glimpse of this national treasure to the public. Planetary scientists at Caltech have discovered a spherical body in the outskirts of the solar system. The object circles the sun every 288 years, is half the size of Pluto, and is larger than all of the objects in the asteroid belt combined. On a mound just a kilometre northwest of the Serapeum at Saqqara, a mission from the Japanese Institute of Egyptology at Waseda University has made two significant discoveries. Imagine a CD with a storage capacity not of 650 MB but 650 million MB. Such a storage capacity is theoretically possible because of experiments using individual atoms to store data. Experts Performed a Top-Secret Restoration of the Shroud of Turin. Fuente Magna - Rosetta Stone of the Americas? Cuneiform and Semitic Signs were found on a stone artifact from Chua estimated to be 5500/5000 years old (the Sumerian/Akkadian period). This piece was found in a Chulpar , burial , in 1948, Chua near the Titicaca. Lake. After close consultation between the Board, sponsors and investors, the Mystery Park Board of Directors decided to postpone the opening planned for November 7, 2002 until spring 2003. This also allows optimal integration of parts of the Swiss National Exhibition Expo.02 infrastructure into the Mystery Park. The opening date has been set for May 24, 2003. The Mystery Park presents the mysteries of this world, based on the ideas of Erich von D�niken, on the 100,000 sq.m. site of the former military airfield at Matten, near Interlaken. "We are not building a UFO park" repeatedly emphasises Erich von D�niken, best-selling non-fiction author with a grand total over 60 million books sold. The seven different theme buildings, set in a star pattern around the main building, present mysterious, to-scale evidence of various past cultures, such as the Pyramids of Gizeh in Egypt or Chichen Itza of the Mayan Indians. Challenge looks to the future, taking NASA's attempts to inhabit the planet Mars as its theme. Erich von D�niken wants the anticipated around 500,000 annual visitors to "re-learn the feeling of astonishment in the Mystery Park" and to ask questions on the wherefrom and whereto of our civilisation. Archaeologists generally agree that the civilisation which spawned Tiahuanaco rose around 600 B.C., and the city was underway by 700 A.D. Nonetheless, by around 1200 A.D. these skilled, powerful and self-sustaining people had disappeared into relative obscurity. A shark held with no male counterpart at Detroit's Belle Isle Aquarium for the past six years has produced three babies in what zoo officials are calling "virgin births." Archeologists digging at Mexico's famed Pyramid of the Moon think they could be a few feet away from a royal grave, key to unlocking the secrets of the first major metropolis built in the Americas. CAIRO, Egypt, Sept. 17 � A toy train-sized robot opened one door deep within Egypt�s Great Pyramid early Tuesday, only to find another, leaving scientists and TV viewers alike scratching their heads. Questions surrounding the origins of the Earth have puzzled scientists and scholars for centuries. Among the most hotly debated issues is how the planet's continents and oceans formed. A new theory by a University of Oklahoma geophysicist may represent a major breakthrough in understanding how the major surface features of the Earth formed, and the theory also has important implications for the beginning of life on Earth. Photos of Mount Ararat contain a mystery object some think is the ark - scientists are now homing in. The controversy regarding photos posted by the Enterprise Mission, a Web site focusing on the enigmas in the Martian region of Cydonia, interpreted as evidence of mysterious buried city-style structures on the Red Planet. The mysteries of ancient Egypt will be unveiled live on a worldwide telecast on Sept 17. Author and researcher Llyod Pye details his findings and exploration to find the truth about the Starchild Project. Robert Bauval continues to update his site with breaking news and comments on the 'Secret Chambers Revealed' saga. Early Chinese, Korean, and Indian Flying Machines - an Article posted on the Hinternet, a journal of ideas and views. Mysteries of the Sphinx, Pyramid Enigmas, Mummy's Curses and Other Contrivances, Resources and more... Excellent Content! Lloyd Pye, the Starchild project advocate, have been selected to appear at a major international conference during the last weekend of next March in Amsterdam. Sponsored by Nexus Magazine, it will include Laurence Gardner, David Hatcher Childress, Jim Marrs, and Dr. Steven Greer, among others. Those able to attend should be well rewarded for their effort. Two critical mutations appeared approximately 200,000 years ago in a gene linked to language, then swept through the population at roughly the same time anatomically modern humans began to dominate the planet, according to new research. An asteroid passing near the Earth - a rare glimpse and collision risk estimate. Upcoming (September 17, 2002) National Geographic documentary titled, Egypt - Secret Chambers Revealed. Is Rudolf Gantenbrink to be deliberately snubbed by the National Geographic? In a program shortly to be released by the National Geographic on September 17th, 2002 showing the live opening of "Gantenbrinks door" in the south shaft of the Queens chamber , it is reported that Mr Gantenbrink is not to be included or credited with his discovery in 1993/4 of the famous "Gantenbrink's door" or for his other remarkable discoveries in the Great Pyramid of Khufu using his tiny robot known as "Uphaut", which now resides in the British Museum. His contribution to modern Archaeology and Egyptology is enormous and many revelations about our ancestors abilities are starting to emerge from his work which was largely self financed and technologically difficult. Millions of people have waited nearly 9 years to see this event which appears to have been constantly delayed or opposed in some form or another. It has been reported that Mr Gantenbrink was not informed that this program was to take place, that he was not invited and that the door will be opened using a robot developed by NASA that is equipped with an industrial bore scope and ground penetrating radar as originally suggested by Rudolph himself to Zahi Hawass, the Director of Antiquities in Egypt. To see the remarkable work of Rudolph Gantenbrink and understand the full story, visit his site at: Uphaut Project http://www.cheops.org. If this alleged report of possible plagiarism is true, it fall as an absolute disgrace upon National Geographic. Please Read ASAP: Opportunity for Justice for Gantenbrink! Ian Lawton has decided to release his long awaited book "Genesis Unveiled" free on the web. This book has taken Ian years to write and research, it is dedicated to uncovering the truth about our ancestors, there are great insights into the effects of the catastrophe that became known world wide as the Biblical Flood. Go to www.ianlawton.com to read this remarkable work or buy it online. The fabled treasure of El Dorado may lie in tunnels and caves at the bottom of a lake in the Peruvian Amazon, according to a Polish-Italian explorer who has returned from a three-week reconnaissance trip in search of the legendary city. A revolutionary development in genetics has raised the prospect of curing cancer and treating lethal viral infections using a technique discovered by scientists during a series of pioneering experiments. An international team of explorers claims to have found the legendary Inca city of gold that the Spanish knew as "El Dorado," deep in the heart of the Peruvian Amazon. CAIRO, Egypt: US archaeologists have unearthed the oldest administrative building used by workers who built the pyramids 4500 years ago, Egypt's Supreme Council of Antiquities said. Space rock due to collide with Earth in 2019? An asteroid discovered just weeks ago has become the most threatening object yet detected in space. A preliminary orbit suggests that 2002 NT7 is on an impact course with Earth and could strike the planet on 1 February, 2019 - although the uncertainties are large. A team of scholars found evidence of a major environmental transformation that helps to explain a puzzle that has stumped Maya scholars for decades: Why would the Maya live in an area where the primary water source is little more than mud half of the year? Paris - The first human created by cloning is scheduled to be born in December, said controversial Italian doctor Severino Antinori in an interview with the French newspaper Liberation on Friday. 120 million years old "Map of the Creator"
"satellite" map of Ural Region, was discovered near the city of Ufa, in Chandar settlement. This discovery could become the infallible proof about the existence of the ancient highly-developed civilization. PRAVDA.Ru held a press-conference on June 6 with Doctor of physics and mathematics, professor of the State University of Bashkiria, Alexander Chuvyrov, who conducts research on this artefact. and in due course it will be seen on the world stage, via a new television documentary. The new TV documentary, an hour-long �Mystery of the Skulls,� featuring the Starchild along with other unusual skulls around the world, may help to provide support for the ultimate DNA test (diagnostic) on the Starchild skull to determine its genetic pedigree. The discovery of a fossil skull dated at 6 million to 7 million years old could rewrite the scientific saga of human origins. If confirmed, the find would dramatically change scientists� conception of where and when our ancestors arose. Among other things, the find could push back the date at which humans are believed to have diverged from apes. The skull is roughly 1 million years older than previously found fossilized remains of hominids, and about 3 million years older than the next-oldest skull. The species was given the scientific name Sahelanthropus tchadensis � referring to the discovery site in Chad, in Africa�s Sahel region � and was nicknamed �Toumai,� a Chadian name meaning �Hope of Life� that is usually given to children born just before the dry season. 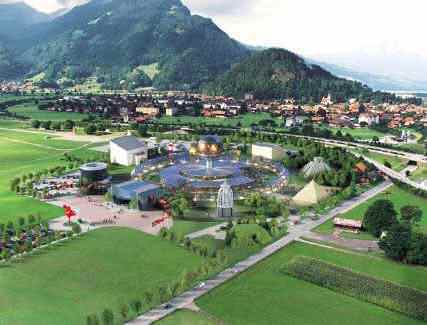 Update on the the "Mysteries of the World" theme park being constructed near Interlaken in Switzerland. The official opening date is May 24th, 2003. The artist's concept of the theme park. Earth's magnetic field is showing strong signs that the poles are due to switch over. Why was the most sacred object in the Bible also the most dangerous? Trace the ancient life of the Ark � from its construction to use as a holy weapon. Does the Ark still exist somewhere on earth? Explore possible scientific explanations for the miraculous powers of the Ark. Could the discovery of a 2000-year-old "battery" prove an ancient knowledge of electricity? Asteroid Passed Within 75,000 Miles of Earth. An asteroid about the size of a football field made one of the closest known approaches to Earth last Friday, June 14, zooming by just 75,000 miles (119,229 kilometers) away, less than a third of the distance to the Moon. A German geologist, Wolf Wichman, asserts that these underwater structures are natural while Graham Hancock is asserting that the landforms must have been cut by humans. Japanese archaeologist Professor Kimura and visiting Indian archaeologist Dr Sundaresh consider it to be man-made. There are real ambiguities in separating man-made and naturally occurring rock features. Neither geologists nor archaeologists have a monopoly of wisdom on this. The causeway is a field of hexagonal basalt columns up to 40 feet high on the shores of County Antrim in Northern Ireland. Local legend attributes them to the Irish giant Finn McCool. According to modern science, Ireland's huge hexagonal columns are a natural consequence of lava cooling. Desert ruin once housed 50,000 souls � and has a temple to prove it. The deserts of Syria may hold many archaeological secrets � but one has recently been discovered by a team of American and German scientists. Join archaeologists in the search for Tiwanaku's past. The prehistoric city of Tiwanaku is located on the southern shore of the famous Lake Titicaca along the border between Bolivia and Peru. The University of Pennsylvania project started in 1995 on the monumental temple of Pumapunku, one of the finest examples of Pre-Columbian architecture. In the last few years, the project has grown to include the entire site (four square kilometers) with participation from the University of Wisconsin, Madison; University of Colorado; MIT; and UMSA, the Bolivian university in the capital of La Paz. LIMA -- Archeologists doing maintenance at the famous Inca citadel of Machu Picchu in Peru have found new stone terraces, water channels, a garbage dump and a wall dividing the site's urban sector from its temples, an official said yesterday. MEXICO CITY (AP) -- Since the 18th century, collectors, geologists and archaeologists have sought the answer to a frustrating mystery: The ancient Olmecs fashioned statues out of striking blue-green jade, but the stone itself was nowhere to be found in the Americas. Now scientists believe they have discovered the source -- a mother lode of jade in Guatemala that could tell much about ancient American civilizations and about the formation of the continent where they lived. The Mars News website has put up a page titled Spaceflight in the Mahabharata. The page takes a quick look at some interesting passages in the Mahabharata, which could be seen to portray a flying vehicle of some description. It's even illustrated with images, right down to those ugly creatures from 'The Fifth Element', just so you get the full drift of the possible interpretations. WASHINGTON (AP) -- The archeologist who led the exploration of Egypt's Valley of the Golden Mummies has been chosen National Geographic's eighth explorer-in-residence. Zahi Hawass, director of the famed Giza pyramids outside the capital, Cairo, was named to the program Wednesday to join such well-known explorers and scientists as Robert Ballard, Jane Goodall and Sylvia Earle.